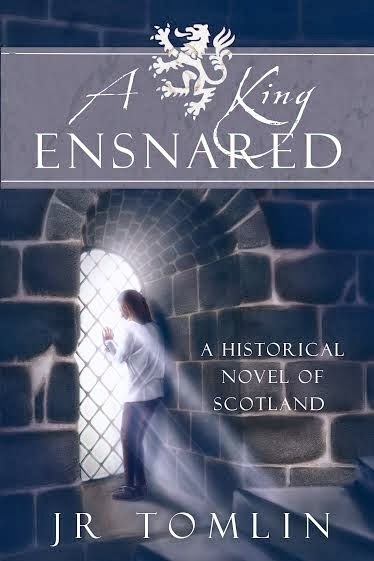 This is from my new Historical Novel, A King Ensnared. I possibly should mention that it is not a Historical Romance although it has a romantic interest which is introduced in it. This is one of my favorite scenes because it is one that he wrote about with such passion and I tried to convey that feeling to my reader. It was wrong that the knife in his belt meant for cutting his meat at table should call to him with its siren’s song. The only thing that kept him from a plunging it into his chest was that men would call him a coward. A nightingale twittered outside. He pushed back from the long table, stiff as a board and his legs half-asleep. He shook out the stiffness, went to the window, and looked out. The little brown bird trilled as it fluttered into the leafy branches of a tree by a pond. Months ago he was allowed for a time the freedom of the gardens. He was still a prisoner, yet the ability to come and go into the courtyard had given him an illusion of liberty that had eased the darkness for a few days. He leaned his forehead against the cool stone of the window, wishing it would cool his fevered thoughts. King Henry… war… freedom… home… They circled in his mind, days after days that turned into year after year, until he felt he might go mad. But the breeze carried a scent of green and spring rain. The hawthorn hedge around the garden below was studded purple with berries. He wondered if there was pestilence in the city that had him moved once more from the Tower to Windsor Castle. He had more freedom of movement at the Tower, was kept less closely for they feared less that he might escape. At least, the view from his window, even in this corner tower where he was stuck away, eased his melancholy. The pond shimmered in the morning sunlight and a willow hung over casting shadows that ruffled when a fish darted to the top. Sun sparkled on a little marble bench. The nightingale trilled again clear, first soft and growing loud. It burst with a rustle of the leaves to a higher branch when a small, white dog rushed up to the tree, yipping fiercely. It jumped, bounced in a circle, and propped it feet as high as it could reach, panting. James couldn’t help but smile. What a silly useless creature, yet it brought a spark of joy into his dark thoughts. A golden-haired girl hurried up, her skirts swishing about her feet. She knelt, James thought scolding the dog as she fastened a gold leash to its collar. He was entranced by the vision. If it was a happiness he could not share, it was one he could watch. It was like soft rain on a parched soul. She looked up at the sky, and even from his window, James could make out her inscrutable smile. When she stood and tugged on the leash, he decided she was older than he had first thought: a young woman rather than a girl, her long neck white as cream and her shape softly curved. He strained to make out more of her face but she bent, speaking to the dog that first pranced about her feet and then darted to nose in the grass next to the pool. When a frog leapt and the dog growled, she threw back her head and laughed. Something in James’s chest burst free. Unmarried she must be, her hair a loose tumble of curls down to her waist under a sheer chaplet. Her green gown shimmered like silk in the sunlight as she sank down upon the bench. She took a small ball out from a purse at her belt and tossed it across the grass for the dog to run after. When she bent back her head, eyes closed, as though she drank in the sunlight, he saw a gold chain about her neck hung with a heart-shaped pendant, ruby red against the white of her throat. James realized he was open-mouthed watching and snorted a small laugh. But she had brought him more joy in these minutes than he had felt in years. Cost, Countenance of War, and Not for Glory. She has also co-authored several fantasies with C. R. Daems: Blood Duty, Talon of the Unnamed Goddess, The Shadow Ryana, The Shadow Gypsy, and Women of Power. In addition to spending time in Scotland, she has traveled in the US, Europe and the Pacific Rim. She now lives in Oregon.